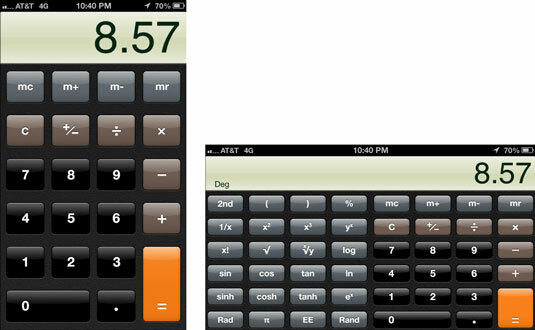 Your handy iPhone calculator does just fine for adding, subtracting, multiplying, and dividing. Numbers and symbols (such as C for clear, and M+ for memory) are large and easy to see. Quick — what’s 3,467.8 times 982.3? Why, the answer is 3,406,419.94 (of course). You can solve the problem quickly thanks to the iPhone calculator, buried (until it’s needed) under another of those Home screen icons, Utilities. Are you thinking that this isn’t exactly the most advanced calculator you’ve ever used? Well, you’re right. The calculator can’t handle a sine or a square root, much less more advanced functions. Fortunately, the math whizzes at Apple were thinking right along with you. To see what they came up with, rotate the iPhone. As if by sleight of hand, your pocket calculator is now a full-fledged scientific calculator, capable of tackling dozens of complex functions. Take a gander at both calculators shown. Isn’t it nice to know just how much smarter a smartphone can make you feel?